As a lifelong Marvel True Believer I had mixed emotions when on perusing the phase 2-3 schedule for Marvel films I saw Dr Strange tucked away in there. The good Doctor, Sorcerer Supreme of the Earth Dimension, has never been one of Marvel’s big-hitters in terms of sales or popularity, yet oddly was one I have fondest memories of. In the reprint collections that were on sale in the UK in the 1970s and early 1980s, some of the early Ditko Dr Strange stories featured in wondrous black and white. With its bizarre convoluted spell names, iconic villains (the dread Dormammu, Baron Mordo, Eternity) and psychedelic art style there was a peculiarity to it, a difference to the standard superhero offerings, which fascinated. 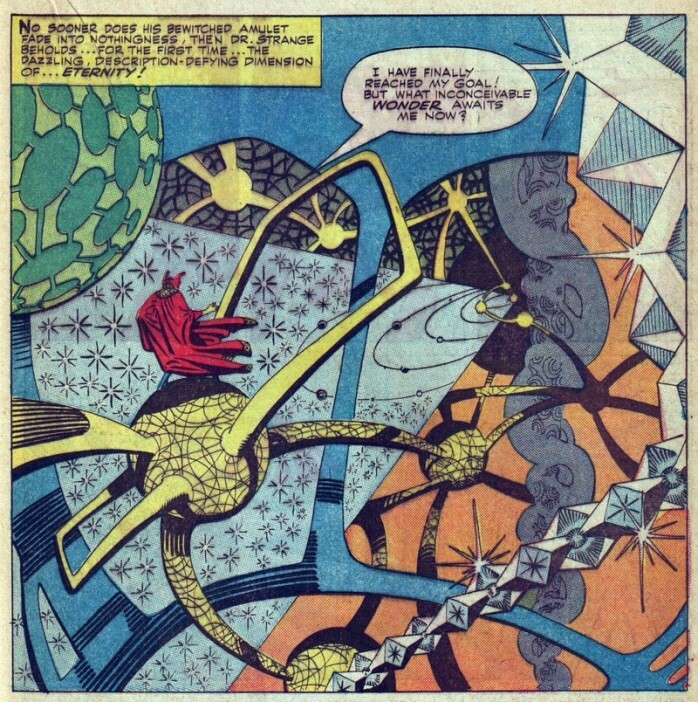 In the comics Dr Strange and his magical world seems to run effortlessly with the hi-tech world of space craft, mutants, time travel and planet eating giants. But the breadth of fifty years of Marvel Universe, with some re-inventions and re-boots along the way (agreeably nothing compared to DC), gives a very broad palate to integrate somewhat inconsistent principles together. There are some villains who straddle the world of magic and technology, Dr Doom for instance, and they work surprisingly well. Yet the Marvel Cinematic Universe is far younger, and has made a solid effort so far to try and hang together and continue between films and TV (obviously the utter non-consistency of the X-men films is a separate studio thing to Marvel/ Disney as they are owned by Fox). And magic… well that’s not really featured has it? To the casual watcher it probably seems a minor quibble when we have green monsters created by gamma rays, a hi-tech knight powered by a reactor in his chest, and a super soldier frozen in a block of ice. But all the origins and characters thus far have been grounded in science, whether earth-bound or not: Iron Man and Captain America, arguably the two most popular of the MCU franchises, are products of advanced science and experiment. Thor, two solo movies and two shared movies under his mighty belt, could be a contender for a magical character. Yet the films convey to me Asgard as a hi-tech alien culture, occupying a pocket dimension, especially when the Dark Elves attack in spacecraft with energy weapons. Loki is a sorcerer in the comics, and perhaps in the films is the only real example of magic with illusions being his forte. 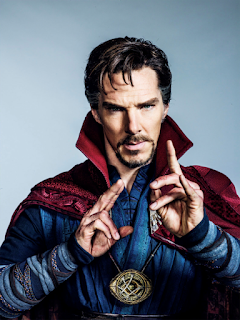 So Dr Strange will be the MCUs first substantive foray into magic, and I wonder whether they will spin it as true magic or as a some science variant, for example manipulation of other dimensional energy with psychic ability or some other cod-physics explanation. There’s no problem if the film is magic in isolation, and the film exists in its own sub-milleu, but the real beauty of the MCU for comic geeks like me is that the films aren’t isolated. The cameos, and the guest appearances, and the cross-overs are what are elevating this series of films beyond anything that’s been attempted cinematically before. The eagerly awaited Captain America 3: Civil War, is in essence another Avengers film, with multiple supporting characters and feels like a Marvel comic cross-over event on celluloid. So it’d be a sad move for Dr Strange to inhabit part of a shared universe in which he can’t interact, can’t contribute… and indeed a waste of Benedict Cumberbatch as an actor! 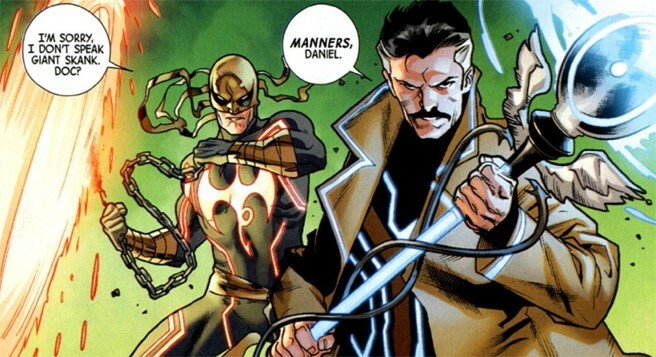 In the comics, Dr Strange was a key part of the esoteric team The Defenders. Although there’s part of me that would love to see Dr Strange levitating into action against Thanos, I feel it more likely that he’d have more in common joining the other branch of Marvel’s visual franchise: the Netflix TV success of Daredevil. Although the adult tone of Daredevil is out of kilter with the likely 12 certificate of a Dr Strange film, the latest series of Daredevil features the Hand and Elektra and covert displays of magic (with a character who just won’t die). Power Man is due next, grounded in science, but Iron Fist on the horizon is a distinctly mystical character that would be hard to do well without some reference to sorcery. It’s difficult though to know how whether the tone of Dr Strange film will match the street level heroes of Daredevil/Jessica Jones/Power Man/ Iron Fist. In my gut… I suspect not, which may then leave Dr Strange as a bit of an outsider in the MCU, but one with a very distinct and exciting flavour. So roll on November, and see what magical delights Dr Strange has cooked up for us under his voluminous Cloak of Levitation.